Isn’t it fun to get a “peek” into another teacher’s classroom? I love learning new ideas by watching other teachers! Although I’d love to invite you into my own classroom, this blog post will have to suffice for now. 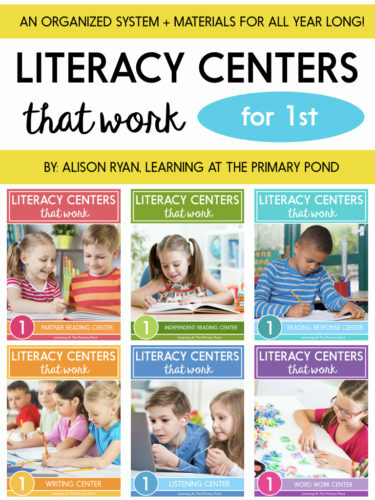 🙂 In this post, I’m going to do a simple, step-by-step walkthrough of what literacy centers looks like, minute-to-minute, in my classroom. Keep reading to get the complete picture! 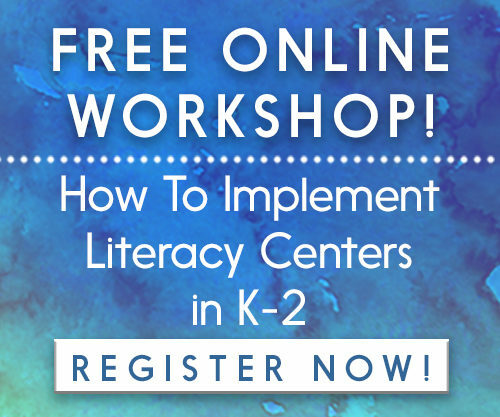 For the purpose of this post, I’ve picked 9:20-10:30 as the sample times for my centers block (my kinder centers block really was this long). 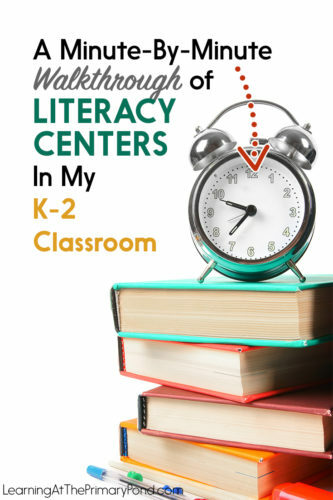 Technically, the kids are only working in centers for 45 minutes – but you’ll see where those “extra” minutes come into play as you read along. It’s centers time! I have the kids grab their individual book bags and independent work folders. They then come back to the rug. I introduce/review an activity that will be added to centers. It’s always an activity that they have practiced before, either in whole group or small group! I only introduce ONE thing per day, for ONE center. Read more about that HERE. I announce which kids are coming to me (I’m not a center—I pull kids from different groups, usually 2-3 different groups). Read more about my grouping strategy HERE. I dismiss the kids, group by group, to their centers. I go to the guided reading table. I set my timer for 15 minutes. I teach a guided reading group, and the kids are in their centers. Even though they haven’t chosen which center they will visit, they DO get to choose what they do in that center. Read more about that HERE. The timer goes off. Round 1 is over! As I’m finishing up with my guided reading group, the other kids start cleaning up. I set the timer again for 3 minutes. The kids (in an ideal situation ;-)) are all cleaned up. They are sitting in their centers, one finger over their lips, another finger pointing to where their group will go next. I announce who will be coming to me. When I give the signal, they rotate! I set my timer again for 15 minutes. Timer goes off. Round 2 is over! I set the timer again for a 3-minute cleanup. Timer goes off again! We rotate! I set the timer for 15 minutes. Centers are over! My kids clean up and bring 1 item to share during sharing time. We have sharing time. The kids get to share with a partner (something they made, wrote, or read during centers). I have 1-2 kids share out with the whole class. Centers are done! Time to move onto something new. 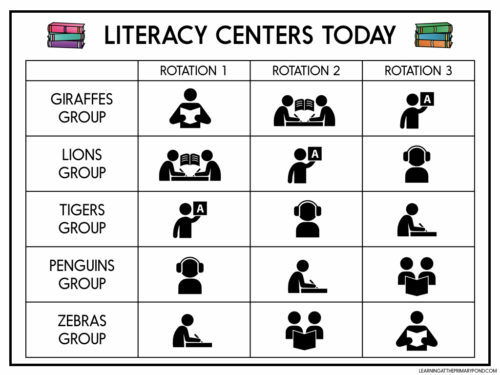 If you’ve ever seen one of my sample daily schedules, you’ll notice that my literacy centers block isn’t usually THIS long (9:20-10:30). This particular schedule is an ideal situation, but I know that you might not have as much time. Some years I just don’t have that long! If you have less time, I would recommend eliminating one of your rounds, or keeping the rounds to 12 minutes, with 3 minutes for clean-up time. I’m sure you’ll have to tweak this to meet your own needs, but I hope it was still helpful! My literacy center bundles are ready and can be found HERE! If you’re looking for an in-depth description of each of the centers my kids visit, click HERE! Trying the centre rotations next week. I have a Grade 1/2 split class ( 12 grade Two’s and only 6 Grad One’s). Two of my grade One students are weak and Grade Two students varies as well. Which bundle would you recommend I get? How often do you meet with each of your groups during the week? For example, do you meet with your lows on a daily basis and your highest only once or twice? Trying to determine how I could meet with only 3 groups a day and hoping to wrap my head around it. My teaching partner and I are wanting to shorten up our rotation time, but are coming from a team where each group is met with every day. Thank you for all of this valuable information! It id definitely helping us to restructure. Hey Melissa! I do try to meet with my lowest group on a daily basis and the highest group twice per week. If your guided reading is not part of rotations, how do you know/or make sure that all your students visit all centers? 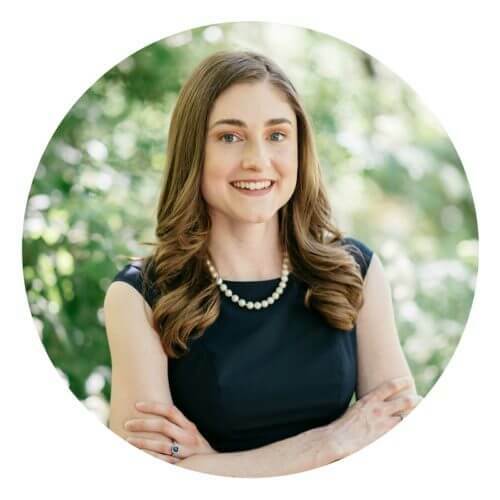 Hi Elisa! When I set up the schedule, I intentionally set it up so that kids don’t miss the same center every time they get pulled for guided reading. I specify which centers they visit and the order, so that’s how I keep track of it.